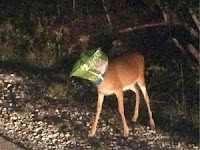 Because we have such a large population of deer here in Wisconsin and Minnesota, we're always on the lookout for fun deer stories, and here's one from the Florida Keys: A deer in the Florida Keys is breathing more easily after a deputy removed a Doritos bag from its head! The Monroe County sheriff's deputy discovered the Key deer while on patrol late Saturday evening. Its entire head was stuck in the chips bag! Sheriff's spokeswoman Becky Herrin says the deer allowed the deputy to remove the bag without a struggle. By the way, in case you've never heard of Key Deer, they're the smallest of the Virginia white-tailed deer subspecies and are endangered. I guess this little guy must have seen all those Doritos commercials and just had to have some! Seriously, though, this is why it's so important to PICK UP YOUR TRASH!